The Uncomfortable Twist, Part 2 – Love. Life. Practice. Figure out what other people similar to you have done to be happy. Seriously, that’s all there is to it. And with the pattern-recognition abilities I described in the prior post, it seems like that would be the easiest thing in the world to manage, right? There’s one problem: we don’t think the rules apply to us. This is the thing: studies have shown that most of us believe we are above average. Read that sentence again, and think about the implications. Most of us feel that we are, to quote Mr. Gilbert one last time, “…more athletic, intelligent, organized, ethical, logical, interesting, open-minded, and healthy-not to mention more attractive.” Yet obviously, mathematically speaking, that is not the case. Screw mathematics, though, we like to believe that whatever the rules, we are the exception. I write this entry in a city based on the fact that people believe they will be winners in games of chance that they know are set up against them. 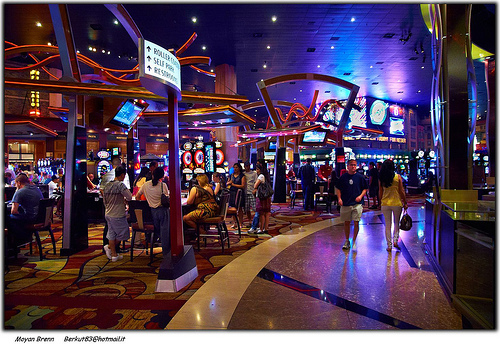 Casinos do not make money by giving it out, and the psychology of how they make you believe that if you just stay a little longer you might win is a fascinating subject. Lotteries make for similar situations – people know that in order for the gigantic money prize to be there, lots of people have to play and lose. But they enjoy the thrill of the belief that they might be the exception. It’s all based around the illusion of control, and how that can make you feel. One of my favorite studies to read about was the fact that in a game of chance – where winning is based on rolling dice – people tended to be more optimistic that they would win if they threw the dice, as opposed to someone else. If we feel that we have some control or influence over a situation, it makes us happier, even when our rational mind knows that the control is illusory. Perhaps some of it lies in the idea of blame vs. responsibility. If you roll my dice and I lose, maybe it’s your fault. Or maybe worse you’re somehow taking advantage of me! But if I roll and lose, well, there’s no one to blame but myself. Even better, if I roll and I win, suddenly I can shift my worldview into a whole different framework. I’m a winner! I’m lucky! Nothing can go wrong today! It seems silly. But at the same time, there is a psychological benefit – ask any baseball player who’s worn his socks through a winning streak, or just ask me how my travelin’ boots and sturdy belt and leather gloves can give me extra endurance when I’m tired and traveling. One of the frequently quoted statistics against playing the lottery is that you have a better chance of making your money back if you flush it down the toilet than if you buy a ticket. A counter-argument is that you don’t get the same feeling of hope and optimism if you don’t buy the ticket, and that’s where the real value is. That value can even be found in a kind of reverse psychology – if you know the odds are against you, it can cause you to double down and try harder. There was a key moment in boot camp when I was ready to give up. They’d broken me down to the point where none of the surface motivators – wanting to impress my parents, wanting to be with my wife and daughter, wanting to earn the title – were adequate to keep me going. I was ready to give up, and quit. In that moment, though, there was one thing that kept me going. My father-in-law, who didn’t care for me much back then, had always expressed scorn at my chances of surviving boot camp. He – and, to be honest, most of the other people who knew me – didn’t think I’d make it. And in that moment of despair, there was simply one fact that kept me going: I would be damned if I was going to prove him right. And so, in a strange way, it was he more than anyone else who gave me what I needed to make it through and become a Marine. That’s one of my favorite words, and I came across it in a Spider Robinson story. It means “A contradiction between two beliefs or conclusions that are in themselves reasonable.” That’s what we have here in the Uncomfortable Twist; we know that we thrive on patterns, we like to know how we fit into the world, but at the same time we insist that we are somehow apart and different from everything else. How can both be true? That was the question I was trying to work out…and I think I found the answer, or at least an answer. But you’ll have to wait for part three, in one week. Also, in my experience the more deeply I realize that any control “I” appear to have truly IS illusory, and the more deeply I realize that I am not apart and different from everything else, the happier I generally feel.